Will Al Gore’s New ‘Climate Reality Project’ End Climate Debate? Former U.S. vice-president and environmental activist, Al Gore, is in the news again. After a scathing attack on climate change deniers and the mass media featured in Rolling Stone, Al Gore, is planning to close the book on climate change “debates” once and for all with “The Climate Reality Project”. News of Gore’s project was released a few days ago on his online blog “Al’s Journal”, and it seems like the type of project that will gain momentum over the coming weeks and months as more people hear about it. The impetus for Gore’s new project is growing frustration by climate scientists and environmentalists at the growing effectiveness of climate change deniers in shifting public opinion on climate change. He notes that sceptics have been able to launch well orchestrated attacks on science with the backing of multi-billion dollar oil and coal companies. However, the climate science side does have one undeniable advantage over the sceptic side: reality. Gore plans on presenting this reality to the world through The Climate Reality Project, which will be launched on September 14th 2011. 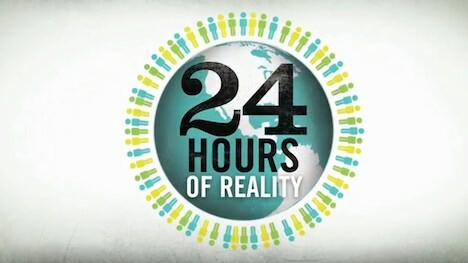 On every hour for a 24 hour period, the reality of climate change will be broadcasted around the world in 24 times zones, with 24 presenters, and in 13 languages. The fact that a debate still remains on climate change is shocking considering the plethora of rigorous scientific evidence supporting it. Consequently, there is no better time than now for this kind of presentation. The scope of the Climate Reality Project is huge and unprecedented. Hopefully by viewing the real-time effects of climate change around the world, people will be driven to acknowledge the severity of our climate crisis and pressure their governments to act on it. Do you think that the Climate Reality Project will be effective in shifting public perception on climate change?